It really shouldn't have been as difficult as it was. I have likely taken 50 photos, just trying to get a half-decent photo of this red-breasted nuthatch. It shouldn't have been so difficult because this tiny little cutie is a daily visitor to my feeders. And, the bird makes multiple trips to the feeders. So why is it so difficult to photo? Well, the bird is fast. It zooms in like a fighter jet from somewhere near the side of the house, grabs a seed and zooms out again all in the same second. I have blurry photos and photos of the bird's back (head down as it grabs its favored seed). But actually seeing the whole bird? This is about is good as it gets. This particular bird doesn't have much of a red breast. It's closer to tawny than red. I'd also forgotten how tiny these birds are--smaller than the Carolina chickadees, which makes them the smallest birds at my winter feeders. My goal for the winter is to take a photo of every species that comes to my feeders. The red-bellied woodpecker is likely going to be difficult, simply as it doesn't show up that often. The sparrows might also pose a challenge as they stay on the deck and don't hop into my platform feeder. But whatever the end result, it should be fun! Note: I will be offline until Monday. I'm heading up to New Hampshire for a board meeting of the Hawk Migration Association of North America. Hopefully, I'll have a few spare moments to see some good birds and take a few photos! This isn't the best photo, but I still couldn't resist. Who can't love a tiny bird with enough moxie to take a seed that size? 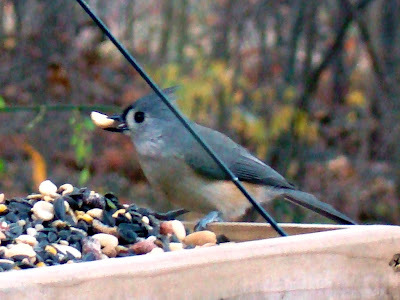 Tufted titmice are a regular feeder visitor here on the mountain. I usually have 4-5 of them, as best I can count. They zoom in and out so quickly that it's rare to have many of them at the feeder at once. They land on the feeder, grab a seed and fly off, though often not too far off, to enjoy their prize and then will zip back to the feeder. I've wondered more than once if they don't use more energy getting their one seed than the seed gives them. Of course, this titmouse won't have that problem. Here on the mountain, November has thus far been appropriately cool, with only one or two warmer than usual days. Leaves still persist, unusually, on many of the trees--especially the oaks. The color is mostly all gone from them, and they are crinkly, brown things that make scraping noises against their branches. It's a Halloween-spooky kind of sound. I wish I had been at home yesterday. I returned to an empty finch feeder, not something the two small goldfinch that are regulars here would have done. I suspect something wonderful that I didn't see emtpied it. Siskins, perhaps? Redpolls? I will likely never know. It is a small mystery in a world of many and many larger mysteries. Whoever they were, at least they found food before disappearing back into the mystery from whence they came. My blog was unexpectedly quiet for a few days, due to connection issues. Wouldn't it be nice if life was as serene as today's image? I took the photo on Sunday morning just before dawn with the moon setting in the west over Nell's Hill. Sometimes I need to look to nature to remind myself that I'm the one who's making my life feel less than serene. The natural world goes on, whatever else is happening, moving in its own slow time. If there's anything nearby that's as close to timeless as we will ever know during our time here on earth, it's this planet on which we all live. Some times I can almost hear nature telling me that it's no big deal, that whatever is stressing me out is not even worth noticing. The sun will still rise in the east. 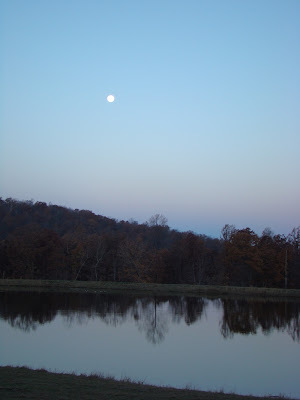 The full moon will still set in the west and will continue to do so long after I am gone. In the meantime, I try and remember and to notice that I am surrounded by small and large beauties everywhere I look. My photos are simply reminders of those beauties, these every day blessings. The serenity is always there. I simply need to remember how to look. November is a favorite time of the year for me. When the leaves are down, I can see deep into the woods. Deer step gingerly over downed trees, a hundred yards or more from the cabin, yet I can still watch them. Life in the woods and my busy life around the cabin finally starts to slow down. It’s as though the bustle of the summer’s long days drops a little further away with every leaf that falls. 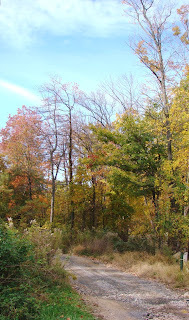 The forest will soon begin its winter sleep and is already settling towards that. Where just a few weeks ago a riot of green once blocked my view, now only bare trees, empty of all color except brown, is all that stands in front of me. Sounds travel further now than they do in summer, a difference that I seem to forget every year. It’s perhaps the one difference between summer and winter where I would choose to keep summer’s silence. And even in summer, the silence isn’t complete. The rustle of the leaves in the slightest summer breeze blocks some sounds, though the leaves themselves create a constant background music. Still, in the summer the forest’s leaves act as a kind of leaf-thin barrier that over distance turns into thousands of leaves and blocks many of the sounds of modern life’s intrusions. Although perhaps 30-40% of the leaves remain on the trees now, this is still quite a change from even a week ago. So this morning before dawn as Dog and I walked in the fog, the sound of a fire siren from more than three miles away sounded loud to me. In summer, I rarely hear the siren at all. I believe the fog and the slight breeze also combined to help enhance the sound, but still modern life suddenly seemed much closer than I like to think it really is. Dog looked up, hearing the trucks as they headed out the road. He hates cars, trucks, bicycles, anything that moves faster than he does. He was convinced the truck was just behind us and lunged at the lead trying to go after it. In his excitement he even missed seeing four deer that tip-toed from the pond, up a bank and through a hole in the netting at the base of the ski slopes. The sound of the fire trucks faded quickly, and quiet returned to the mountain. November is here, and with it the silence of the season returns. This past Saturday evening I was in a forest other than the one at Roundtop for a change. 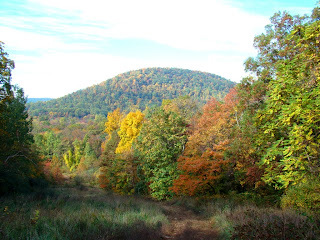 Just north across the valley from Roundtop, about 7 miles or so, is the next ridge of the Appalachian Mountains. These ridges to the north are actually the last ridges of the continuous chain of Appalachians. So Saturday evening I traveled into this deeper realm, which is itself an anomaly in my area. I went into a long draw between two of these ridges. It’s an area of fairly flat land and yet it is still forested and that’s the anomaly. In this area, the mountains, even today, are largely still forested, and few people live in them. But where the land is flat, the land is usually cleared of forest. Years ago, the forests were cleared for farmland. Today, some farms are still around, though far fewer than even 20 years ago. Joining the farms in the flat lands between the mountains are suburbs and towns and strip malls. Having forest in flat land at the base of the mountains is unusual. If you look at my photo from Friday’s blog entry, you will see exactly where I was. It’s the area darkened by clouds in the center of the photograph. Several reasons that I know about combined to save this lovely draw. I don’t know the entire story, so pieces of my knowledge are missing. For the past 50-60 years, perhaps a bit longer, the area has been owned by the Boy Scouts and is the site of their Camp Tuckahoe. About 100 years ago, this was an area of small and local clay mining, charcoal production and, I believe, a little pig iron mining. When I was a very young child, my father often took me on Sunday walks up in here, pointing out the round charcoal pits that are 12-15 feet circles, about 3-4 feet deep. These were where charcoal was made, in smoldering fires that were never allowed to flame, carefully tended continuously for days on end. The remnants of the clay mining never looked like much to me—just a cut into the bank that resulted in an area barely big enough to park a few cars. Of the iron mining, I never saw any forest damage, but I remember the raised foundations of the trestles that carried the iron out of the woods. These were hardly more than head high and on Saturday night I couldn’t even find them anymore. This mining ended in the early 1900’s and apparently never amounted to much even in its heyday, though it provided some few local jobs. Even during its production days, the area remained forested around these operations and was never cleared. When even this small production petered out, the land was essentially abandoned, and this is the part of the story I don’t know. It would have been more typical at this point for the area to be cleared of its forest. But it wasn’t. Perhaps the owners hoped production would resume at some point. Perhaps the first World War intervened and by the time it was over, clearing land for new farms wasn’t a priority. I don’t know. But for whatever reason, the land wasn’t cleared, and in the intervening years, the forest has eliminated virtually all traces of the operations here, unless you remember where to look and know what you are looking for. 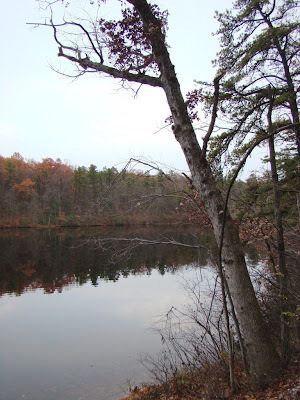 My photo today was taken near dusk on a cold and overcast November day. Yesterday’s first snowfall of the season wasn’t a big one, but it still tied a record for the day, such as it was. I got about half an inch of snow from a storm that was relatively small in size, but folks who live in the middle of the storm’s track are seeing up to 10 inches of snow. I just got clipped by the edge of the storm, so I didn’t see much of it, though people even a few miles north of me saw a bit more. The snow started as sleet shortly after dark last evening, the sound of it made me look up from my book. The weather had been cold and threatening all day, but nothing had come of it. When it was time to run the dogs for the last time in the evening, I already had a quarter of an inch or so down. I was waiting to see what they would do when the first saw it. Dog is well-experienced with snow. He likes it. We’ve camped in it together. I put the leash on and opened the door. Like the middle-aged gentleman that he is, he took one look at the snow, sniffed it and stepped outside, ready for a run. Once off the porch, he happily ran his nose through the snow and dug in it a bit, but overall he was fairly blasé since he’d seen before and saw it as soon as I opened the door. He accepted that it was there, and was ready for fun. Baby Dog, as you might expect, was a different matter. I opened the door, and out she bolted. Her legs went every which way. She fell onto her side, chin hitting the deck and then slid down the steps. She finally recovered her footing at the bottom of the steps and then looked at me as if to ask, "where did this stuff come from?" Observant, she is not. Once outside, she launched into ricochet mode, racing back and forth as fast as she could, slipping and tripping every time she tried to turn. I hope as she gets older that she learns to pay attention to what’s going on around her just a little bit more. This half-inch snowfall does tie the record for the day, but it’s a record that’s aching to be broken, surrounded as it is by other daily records ranging from 3-9 inches of snow. This record should be an easy one to break, but not this year. 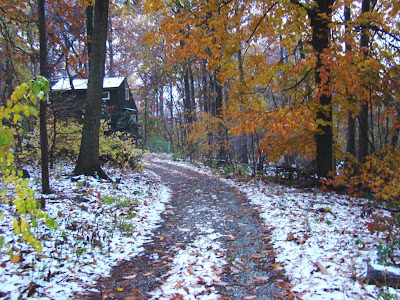 Today’s main photo is of my snow-covered driveway. It was barely light enough for a photo when I left this morning, but I figure the snow will be gone when I get home from work today, so I had to try for at least a few snow photos. 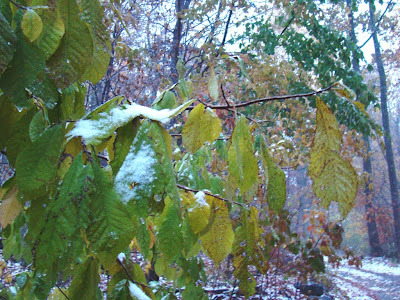 The second photo today is something I don’t know if I’ve ever had before—green leaves covered with snow. It’s not that unusual here to have snow on autumn-colored leaves, but I don’t ever remember having snow on green leaves before. Tomorrow the temperature is supposed to near 60 degrees. I guess that means this snow won’t last, huh? Last night, the rain ended and the wind picked up, bringing down a few leaves, but only a few. This morning it is clear and beautiful, so I thought I'd show you a photo I took this morning as I was leaving Roundtop and driving to work. 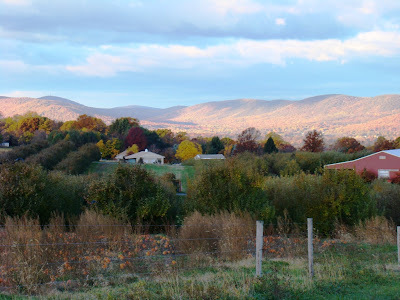 The mountain in the photo is the next ridge to the north, with my neighbor's farm in the foreground. Despite the wind, the trees on the farm and the mountains are both still covered with leaves. It's chilly here--in fact I might well have snow tomorrow night or at least a snow/rain mix. Perhaps the weight of snow will finally be enough to drop the leaves, though they normally are all down on their own, without benefit of snow, by November 1. I have come to think that higher than normal nighttime low temperatures throughout the fall are the culprit in the leaves overstaying their welcome. October's average temperature was nearly 7 degrees above normal, but much of that higher result came because the day's low temperature averaged more than 9 degrees above normal. I expect this season's long-lasting leaves to cause some atypical changes in the forest around me, but I don't expect to fully see what those changes will be until next spring or perhaps even summer. 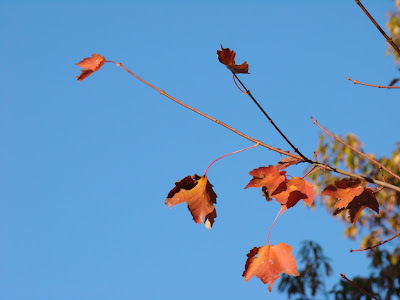 Since the leaves won't have as long to decay as usual, I expect the changes that result will center around that. I can anticipate that spring growth might be affected. Perhaps the species mix of the plants will be different as a result. That could affect food availability for the summer birds. Theoretically, I might say that the differences might be interesting to observe and document, though I don't expect it to be interesting in a good way. I also think I can see a winter project in the works, which will be to further hone my plant ID skills and try to better inventory what's here now and what's here in the spring. Paying attention to what's going on is the first step in understanding it. Today it is raining hard, so hard that neither Dog nor Baby Dog nor I got anything resembling a half-decent walk this morning. As it was, all three of us came back inside soaked to the skin. In my case, I was soaked despite a hat and a raincoat. Okay, so it’s not the rain that’s odd, even in mid-November. Today’s is a cold rain with a strong breeze, the kind of precipitation and day I can expect when it’s not quite cold enough for snow. What’s odd is that the 70% of the leaves that are still on the trees are not coming down despite the rain and the wind. The leaves have virtually all turned a color that’s somewhere between deep orange and brown. They are no longer pretty colors of yellow or red or even orange. These are leaves that are dead and brown. But even after getting hit by drops of rain big enough to hurt my face when they struck and even after being buffeted by a breeze that strong enough to make hearing difficult, those leaves are still not falling off the trees. And given that it’s now mid-November and that these leaves should have all been carpeting the forest floor 15 days ago, what’s up with that? I’ve never seen anything like this. Call it climate change, call it what you will, but this is simply wrong. This is the kind of thing that has a ripple affect that impacts probably twice the processes I can think of. Once the leaves do eventually drop, how much longer than normal will it take for them to decay? 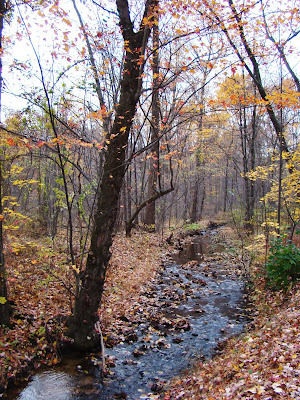 How will delayed decay impact next year’s forest growth, especially in the understory of the forest? 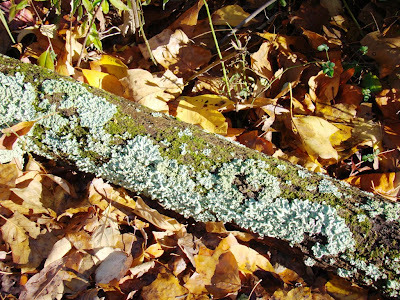 Will it change what plants grow in the understory, favoring some species over the ones that typically make up the understory? If the plants are different, how does that impact the animals? How does the leafy canopy that’s currently overstaying its welcome affect the temperature in the forest today? Or later in the winter? What I’m seeing now isn’t a little change. It’s profoundly different than normal here in this forest. It's past time to be doing something to stop it. It's past time to be pretending it will go away on its own. It might already be too late. 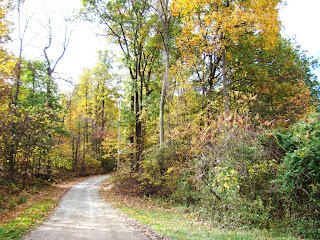 The forest around Roundtop is mostly an oak and hickory forest, with a fair amount of tulip poplar, beech and sassafras thrown in for variety. Conifers are in short supply. 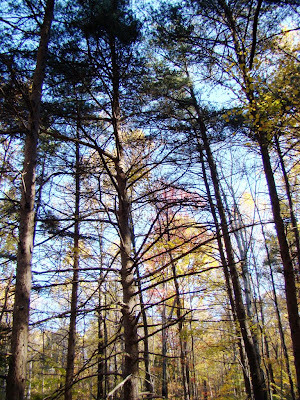 The edge areas have the requisite cedar trees, but a stand of pine trees, like those in today's photo, are rare. I know of two more stands of pines on the mountain, other than this one, though one of those has been cut back recently, and the other is well down the mountain. I'm always surprised when I am near the pines at how quickly the sound of the forest changes. Leaves lapping on leaves change to whispers between pine needles. The pines are so much quieter than the ever noisy leaves. The smell changes too. Leaves smell of deep rich earth, and pines have a sweet smell. I often find the whitewash of owls here, though they don't restrict themselves to the pine trees by any means. Still, they do seem to prefer them for sleeping and nesting. Once a bald eagle was roosting in one. I was walking on a trail when the bird suddenly came crashing out of the tree with a racket that was terrifying until I saw what caused the noise. The bird had been so deep in the tree that it was invisible, and I was within only a few feet of the tree when it spooked. In the winter, I enjoy walking in the pines primarily because they are green in a brown and white landscape. In other seasons, I enjoy them for their sound and smell. When you live among oaks, as I do, walking in the pines almost feels as though I'm on vacation to some other new and vaguely exotic place. I enjoy the difference. Here it is mid-November, and at least half, if not more, of the forest's leaves are still firmly attached to their trees. A few of the trees' leaves are even still green-ish. What's truly bizarre about this is that in a normal year, all the leaves are down by the first of November. At this point, I don't think this oddity can be blamed fully on temperature. The temperature has steadily dropped every day for nearly 3 weeks, and I've now had 3 good frosts in the past week. The November temperatures are actually below normal now, but the leaves still show little sign of falling. I was figuring they were only waiting for a good breeze to finish them off, but I had that this past weekend, and it didn't help much. It looks really odd outside to have the weather as chilly as it is but to still have so many leaves on the trees. I wonder what larger effects on weather these clinging leaves might have. In summer, the leaves keep the hottest temperatures of the day from penetrating under the canopy, so I stay cooler at the cabin. I track the minimum and maximum temperature each day, and what I'm seeing now is that I'm having warmer overnight temperatures than Harrisburg does down along the river. The daytime temperatures are still cooler than Harrisburg. Do the leaves play any role in my warmer overnight temperatures? Or is that difference all due to my higher elevation? There's so much I don't know. Every year has its own oddities. Sometimes the effects of those oddities are obvious, and parallels can easly be drawn. Other times, like now, it's more mysterious, though that veil of mystery could likely be parted with a little knowledge. I will investigate, though I don't know that I expect to find an answer yet. It might be too soon for answers. but winter lies ahead, and I will have time. Any day that I see an adult bald eagle flying directly over a Susquehanna River bridge as I’m crossing said bridge on my way to work has to be a day when my blog is dedicated to birds. Sorry, there’s no photo of the eagle. It’s a blessing I didn’t crash the car. Still, the sighting is a great way to start a rainy Monday, or any Monday, or heck, even a Friday. 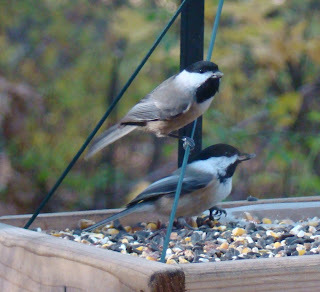 See the two chickadees in today’s photo? It’s not as good a photo as I would like, nor does it show all the important field marks, but in my opinion it does show a Carolina (top) chickadee and a black-capped chickadee (bottom). Two of the field marks that this photo does show pretty well are the differences in the bibs—the bottom edge on the Carolina is neat versus the black-capped's ragged bottom edge. And to some extent you can see the white wing edging on the black-capped versus minimal white wing edging on the Carolina. The bird on the wire is also smaller than the other, though because it is also a bit closer, that doesn't show up as well. There's also very slight differences in color, and the black-capped's tail is very slightly longer than that of the Carolina's. I'm also tempted to call the cap on the black-capped as extending further down the head/neck, but because of the angle at which the Carolina is perched, that might be a bit deceptive. The bird activity at my feeders is starting to pick up, and I’m already getting a sense of who are going to be regular visitors this year. The numbers I will report for each species represent the total number I’ve seen at one time, so it’s likely this number doesn’t represent every individual, but it represents at least the minimum number of that species. For example, I regularly have 4 blue jays that arrive together like a squadron of bomber jets, scattering smaller birds in every direction. But at some point in the day, I will have a single blue jay arrive and feed. Now is this simply a hungrier bird of one of the four who breaks formation and sneaks off to get an extra portion of food? Or is this a different blue jay that travels on its own? I don’t know. I suspect it’s blue jay #5, but I have no way to prove that, so I only report 4 blue jays, the number I’m sure of. 2 white-breasted nuthatch - I only see one of these at a time but one has a cap that’s dead black and the other’s cap is a dark gray. 1 red-breasted nuthatch – This little cutie is now a regular at the feeders. So far my photos have been poor, to say the least. I hope to get at least one good photo of it before it disappears. 2 cardinals - so far. I'm pretty sure there's at least 2 pairs, but so far I've only ever seen one pair at a time. 2 goldfinch – Likely more are around but my finch feeder has only two perches and so far I’ve seen no sign of finches stacking up and waiting for an open slot. This morning snow is in the air. I can smell it, though I haven’t yet seen it. The air is raw, the kind of chill that penetrates, no matter how many layers of warm clothing I’m wearing. I don’t expect it will amount to much—a few flakes, a thin frosting on the ground at the most. This scent of snow isn’t enough for the feeder birds to act like sharks in a feeding frenzy. On days when snow is going to amount to something, the birds hover around the feeder all day, emptying it ask quickly as I fill it. Sometimes they don’t even bother to fly when I approach with more seed. Today, they are acting normal, so I only give them the usual amount before heading off to work. The temperature here has been steadily dropping since it began a descent on October 28, now 12 days ago. After the record-breaking heat last month, it’s taken that long, but now I am running about 10 degrees below normal on average. Oddly, the real difference hasn’t been in the nighttime low temperature, but in the day’s high temperature, which barely climbs 7 or 8 degrees above the nighttime low. Usually, the day is 15 degrees or so higher than the night temperature. Perhaps it is because the warm weather hung around so long, but this morning I heard a killdeer in one of Roundtop’s parking lots. During the summer, close to a dozen haunt the dirt parking lots and pond edges. This morning I heard one call, expecting it to be the last time this year I hear its sound, but then I heard a second return the call. Today ties my latest record for this species at Roundtop. If I hear them tomorrow, I will have broken my 15 year string of records. Will this dusting of snow send them south overnight? Or not? Only tomorrow will tell. Note: The photo was taken last weekend of what was the last sunny day of the week. 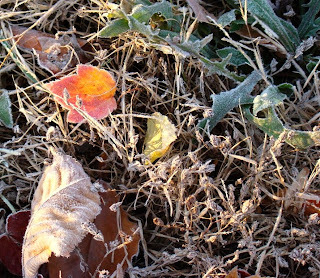 Frost finally found its way to the mountain last night. It wasn't a "maybe it frosted before I saw it" kind of frost. It wasn't a frost that happened 100 feet in altitude below me kind of frost. It was an actual frost. Better a full 30 days late than never, I guess. This morning the ground was white with it, suddenly changing the landscape to mostly sepia tones and dimming the bright colors of fall. It's more than past time. So far, November's temperatures are typical ones, perhaps even a tiny bit below normal, though only just and not yet nearly cool enough to make up for the heat of October. I think it was cool enough, and for long enough last night, to be a killing frost. I'll be better able to determine that this evening when I return to the cabin and see if the vegetation is wilting. Still, it's a start. This year’s autumn is apparently producing "stages" or partial leaf color change all over the place. Yesterday, ChicagoLady commented here that’s what was going on over her way. Last night I was on a conference call for the Hawk Migration Association of North America and found out that’s what was happening in New Hampshire too. And people all say they’ve never seen anything like it. Dry weather is implicated as the cause for this, though I’ve also heard that should only account for the first and earliest "stage," not the three stages of color change I’ve had since. I suppose you could say it’s interesting in an odd sort of way, but I’d be just as happy if it didn’t happen again next year. Here at the cabin I’m anticipating and getting ready for the first snow of the season, currently in the forecast for Friday. Oddly, I haven’t yet even had a good hard frost. I’ve had snow before when the leaves were still on the trees. It wasn’t a pretty sight. Branches broke from the weight of snow on leaves. Tree limbs came down and knocked out power. I could do without all that. I’m still adjusting to last weekend’s time change. It’s not nearly as light in the morning as I expected (hoped). This shouldn’t surprise me by now but it did. I’m already nearly at the point where it’s dark when I leave for work in the morning and dark when I get home in the evening. It might just be light enough to try for a sunrise photo if an especially pretty one presents itself—it hasn’t yet—but that’s about it. This weekend, I will need to take more photos to get me through the weekdays when it’s too dark for photos. The lack of daylight also means I don't get to see the birds that daily empty my feeders, and I really miss that. Instead, the weekdays are filled with sightings of large, brown mammals darting in front of my car. Whew! Missed another six. Walking along old woods roads is one of my favorite ways of getting deeper into the forest around me. The eastern forests around me tend to have a lot of undergrowth, so bushwhacking isn't easy or even feasible, not to mention that I end up trampling the understory. But woods roads were cut years ago, for purposes long past being important, so today they are little used, often forgotten. Often the roads don't really go anywhere, at least not anymore, so a traipse along one is the kind of walk where the journey is always more important than a destination. And in the autumn, the old roads are leaf covered and tree draped, graceful and peaceful paths that are lined with beauty. To me, walking along one feels as though I am walking back in time--back to a quieter, simpler time with less noise and bustle. It's impossible to feel stressed or harried when I'm walking on one of these old roads. In an way, it's just as well for me that most of these roads don't go anywhere. I get caught up in them too easily and always want to see what's around the bend. The path ahead, ever and always, draws me onward. If the roads kept going on, whether for miles or for decades, I would likely keep going too, unwilling to turn around and head home, when an unexplored bend in the road lies ahead. The bird feeders at the cabin were busy this weekend. I saw most of the usual winter suspects. 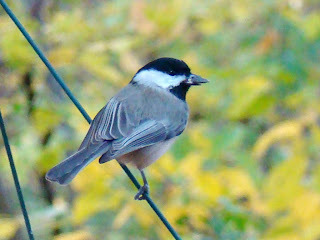 This little fellow is a black-capped chickadee with a seed in his beak. In this area, I’m supposed to be politically correct and refer to the chickadees I see as "chickadee species," since both Carolina and black-capped chickadees are present and will interbreed. (And since they do, doesn’t this make them a single species? But I digress.) Just to be clear, I am not now, nor have I ever been politically correct, so I’m saying this cute little one is a black-capped chickadee. 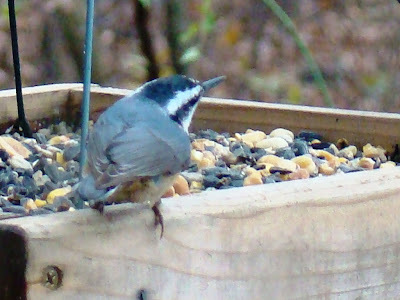 I do have Carolina chickadees at the feeders too, though they are still in the minority (but a growing minority). When I get a good photo of one of those I’ll post it so we can compare. The reasons I’m calling this little cutie a black-capped chickadee is 1) because its white face patch continues as bright white throughout the patch. In Carolina chickadees, the white patch fades to a pale gray past the eye. 2) This fellow also has a nice amount of white on the wing edgings. White wing edgings are in short supply on Carolinas. 3) The bird is quite buffy on its belly, which you can only just see a tiny bit around its legs. The Carolinas are pretty uniformly gray underneath, with little or no buffy color. You might also notice the background of this photo. Yes, there’s yellow back there, but also quite a bit of green, which is completely atypical for November 4 (when I took this photo). I’ve never known of any year where the leaves weren’t completely down by November 1. But this year, not only are many not down yet, many are even still green! The leaf change has come in stages this year. At the moment I’m in stage four, and I suspect there will be at least one more to come. By stages I mean that some leaves turn color, then a good wind will come along and all those leaves will drop. What’s left are leaves that are still green. Late last week it looked like late August or mid-September again for a few days. In a normal year, there are no "stages." The leaves simply all turn color and drop within a week a so, gone with October’s end. Even the local weatherman remarked on the leaves this morning—the first time I’ve heard anyone else mention it or even notice it locally. The temperature is near normal for November, at the moment. I’m guessing the record warmth in October is the culprit for the weird and late leaf drop this year. Who know what will happen next? I’m trying to hold out hope for a decent winter, but I’m not sure I really believe it will happen anymore. Fall is finally settling in around the cabin. 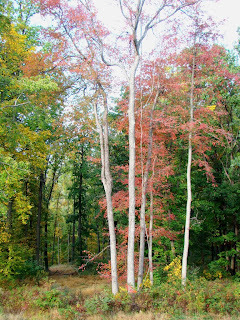 The leaves have changed color, even though many still persist in hanging onto the trees. The land no long feels particularly warm underneath a chillier air. The birds that change plumage with the season are now in their drabber togs. Even the deer are turning the dull brown of winter. And yet a few holdovers from the warmer season persist. The killdeer are still hanging out in the parking lots, though I think I am hearing fewer of them than I did just a week or so ago. Yesterday I saw a great blue heron at one of the ponds, one of my later records for the mountain. I can feel the forest around me quieting. The effusive dawn chorus of spring no longer greets my mornings. Instead of singing birds, I am more likely to hear the angry chatter of squirrels or the territorial white-breasted nuthatch who’s determined to keep all comers from the bird feeder. In the summer, leaves touching each other in the breeze make more noise than you might expect, rustling with almost no provocation. Surrounded as I am by thousands of trees, the leafy whispers are a constant backdrop. Now, with each leaf that drops, the forest quiets a little more. Soon the only sound the trees will make will be the sound of wood against wood, and that only when a breeze with some strength behind it moves across the mountain. I always look forward to this time of year. It’s a time to relax from the more hectic time of summer. With the early darkness, I don’t feel as guilty in the evenings when I put my feet up to read or knit. In summer, when the daylight lasts until nearly bedtime, I feel a bit guilty about wasting the daylight by settling down too early. No longer, as now there’s no daylight to waste. The dogs slumber at my feet, eager for bedtime, though to me it doesn’t look like much about that will be so different from what they are doing now to anticipate it they way they do. Still, they follow me with their eyes, lounge underfoot, grumbling a bit, hoping that I will soon settle down for the night so they can too. It’s quiet. It’s November. If you follow the old calendar, happy new year! Halloween or Samhain was in times long past considered the last day of the year, which makes November 1 the first day of the new year. The year itself was commonly called the turning of the wheel, which I’ve always thought was a pretty good description. What people called the year before they invented the wheel is lore long lost. October turned out to be a good month for birding on the mountain. I ended the month with 33 species seen here, up from the paltry 28 of last October. I’m now at 82 species for the year, which is quite good, except for the fact that I had almost no warblers this year. Perhaps the warmest October on record helped improve my bird list. I suppose it has to be good for something. I’ve decided that I don’t care for the extended daylight savings time in the fall, though I like it a lot in the spring. I’m looking forward to the time change this weekend, as it will again be light enough to take photos before work (at least for a little while). For the past 10 days or so it’s been too dark in both the morning and evening for photography. "Today's" photo was actually taken the better part of a week ago. A few days later the colors intensified for about 48 hours, then many came down in a rainstorm. Now, the leaves that are left are mostly brown but are still sticking onto the trees longer than they should be. 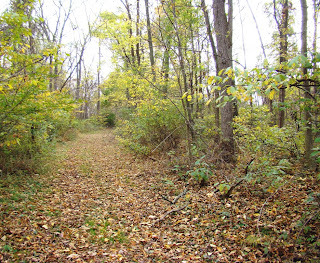 In a normal year, all the leaves are down by November 1 in this area. Today, I'm guessing that less than half have fallen. The cabin is now as prepared as I can make it for winter to arrive. The plants are inside. The windows are closed and sealed. (Most of) the gutters were cleaned. I’m ready. Bring it on!